1. Percents may not add up to 100 because responses of ‘don’t know’, ‘refusal’ and ‘not stated’ were included in the calculation of all estimates and rounding. 2. Excludes children who are currently attending school. 3. Child care arrangements refer to the care of a child by someone other than a parent, including daycare, nursery or preschool, Head Start, before or after school programs and care by a relative or other caregiver. 4. These data refer to the main child care arrangement; that is the arrangement in which the child spends the most time. 5. All Indigenous children in the Yukon and Northwest Territories (on and off reserve) were included. 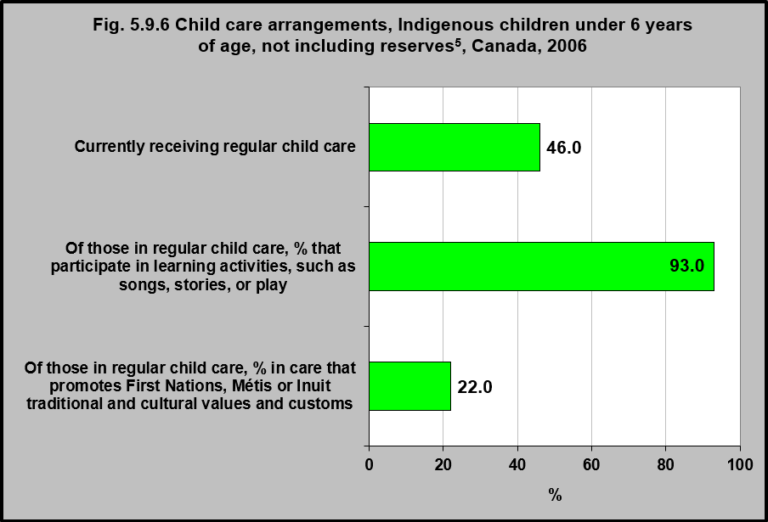 In 2006, of those in regular child care, almost all (93%) of Indigenous (First Nations living off reserve, Métis and Inuit) children under age 6 participated in learning activities, such as songs, stories, or play. Only 22% of these same young children were in child care that promoted First Nations, Métis or Inuit traditional and cultural values and customs. 1Ball, J., & Moselle, K. Contributions of culture and language in Aboriginal Head Start in Urban and Northern Communities to children’s health outcomes: A review of theory and research. Ottawa, ON: Division of Children, Seniors & Healthy Development, Health Promotion and Chronic Disease Branch, Public Health Agency of Canada.